Have seen that one before. 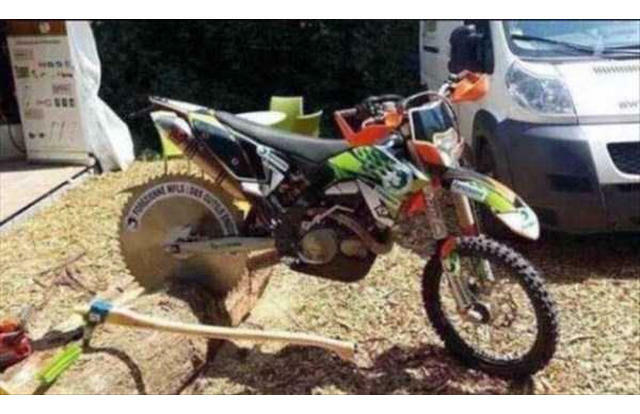 In some ways quite clever, but with a circular saw and chainsaw at different levels, rather dangerous. I don't mean just a health and safety nightmare, but really dangerous. I seen that before as well Chris,and still looking at it again,that wood looks half rotten that he`s cutting,unless its my eyes. It may well be. Not sure I would like to use pedal power for something solid like oak, but the principle is a good one, even if that particular set up is pretty poor. Well that is just silly! Doesn't seem any way of stopping the thing driving off of staying upright. Out of interest, could you give rough idea about how much fuel it would use to cut up a year supply of wood? Say, 10 cubic meters? I keep wondering about using a water powered blade, as we have a stream, one day perhaps. One thing about the OP, one of the narrow kerf chains and bars would help, I've been quite impressed by the 1/4" Picco chain I'm currently using. It would produce 10m3 of loose tipped firewood of average size in about 3 hours with two people doing it with the right feed stock. That would use about 7-10L aprox. We have a firewood processor too, and that would work at a similar speed. Ours is connected to a tractor and think we are using larger and fully hardwood logs on ours. Probably no more fuel used though. I would say the main fuel use is in delivery, although to make it economic, you need to use fuel to cut, extract and process the firewood too. When we started we used a chainsaw to cut the wood to length in a stand called a Buckingham Woodstation http://www.jocemetal.co.uk/page7.htm although I haven't seen anything of him lately, so don't know if he is still producing them. They are brilliant, and we still use ours for cutting the timber for the charcoal kiln. Splitting was by axe, and my job was to place the logs and then pick up the bits, as I am not that good at using a felling axe. Hard work, and limited to about 2 cu m a day because of the work involved. We started using a chainsaw & hand splitting. Then added a tractor powered hydraulic splitter. After looking at running costs we added a PTO powered log saw to the tractor. It was cheaper to run the tractor than the chainsaw. Mainly due to the cost of quality bar oil. We looked at tractor PTO powered processors. However we thought that by spending a little extra & having one on road wheels (not all wheeled ones are road wheels) & its own engine we could then also hire it out to recoup some of the cost. Once the petrol engine is worn out (should be a while its a real Honda) we will fit a diesel version. You can also add the PTO powered parts as well but to be honest the running costs on petrol are not that bad & dont really justify the cost at this stage. Our first firewood processor was a petrol powered one with a chainsaw, but after a good few years of cutting 110 cu. m per year of hardwood, rather than the 50 cu a year of softwood it was designed for, it is now on light duties, and we do find the conveyer quite useful if we are hand loading from the log store. We didn't want to rent ours out/let other people use it, as even having the circular saw blade retipped costs a fair bit, and a new blade is over �400, so we preferred to just use it ourselves. We didn't want to rent ours out/let other people use it, as even having the circular saw blade retipped costs a fair bit, and a new blade is over �400, so we preferred to just use it ourselves. Its only rented WITH an operator. Ours is chainsaw based so that limits damage a little. We fill 1/2 & 1m3 "bags" / trailers so the conveyor is essential to minimise handling. It also picks the lengths up so saves my back. Sending someone out with it certainly minimised damage. We do loose loads and log sacks, so tend not to do it into dumpy sacks unless we want to do a half load to unload fairly easily, or 2 half loads into the shorter backed truck. We can get 2 dumpy sacks in but not 2 of our half loads very easily. I guess you cut & split straight in to the vehicle? We like to cut & split then stack to let it dry some more. We buy in lengths that are already well seasoned but its still good to split them first. Using vented bags (not builders bags) make handling easy.